Prominent & Leading Manufacturer from Mumbai, we offer disc brushes and fruits washing brushes. We are engaged in manufacturing, exporting and supplying of Fruit Washing Brushes to our clients. Used to clean vegetables and fruits in bulk quantity. 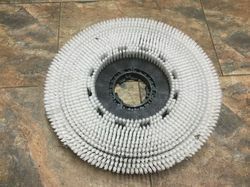 Note: Rate varies according to the specifications which includes length of the brush, filament material used, diameter of the base and overall diameter of the brush etc. Looking for Food Processing Brushes ?